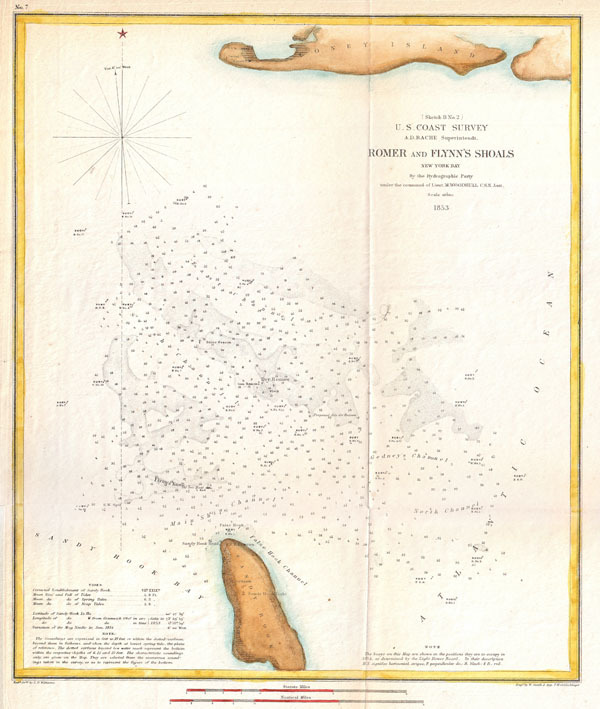 A very attractive example of the 1853 U.S. Coast Survey chart or map of the Romer and Flynn's Shoals. Details the shoals located between Coney Island and Sandy Hook in New York Bay. Offers numerous depth soundings, tidal notes, and notation on buoys. The hydrography for this map was accomplished by a party under the command of Lieut. M. Woodhill. Prepared under the supervision of A. D. Bache for the 1853 Report of the Superintendant of the U.S. Coast Survey.